Left foot left semi step, toe, feet shoulder width, two sincere heart toward holding in the waist, two small arms parallel. The chest and abdomen, arrive on the tongue, jaw, visual left. (1) the left foot lift straight on the right knee. At the same time, the left hand palm down to the left under variable and variable standing palm right on the run, readily go. When the left hand to head right above the vertical drop is placed in the right axillary, palm facing right, look left. 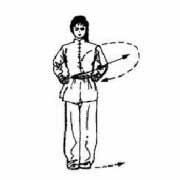 The focus shifted to the left, right leg straight, left leg left arch into the left bow step, at the same time, the left hand become sincere heart toward to the waist, body left, right hand fist down move out, Lida in right hand, arm at shoulder level and at the same time, the visual front. (1) the right kind heart toward to the waist. Bring his right foot straight forward kick. At the same time, left sincere heart down move out, force of the left fist, eyes to the front. (2) constantly on the move, body left, right foot landing legs, squat, double knee abduction of a horse not step. The left hand turn palm, palm facing the front frame in the head about 10 cm above. His fist down right out, Lida r.. Visual right. (1) the left foot up straight on the knee. Body left turn, left turn boxing, boxing heart upward at the waist. Then put the palms of his hands up, left on the forehead to left run, palm down to his left knee above, before the visual type. Constantly on the move. (1) body left 180 foot lift straight on the knee. At the same time with variable palm relative operation, right palm on the left wrist. Towards the right road, fingertips towards the right, palm forward. The left hand palm down, running along the right arm, palm facing right on the right axillary, visual right palm. (2) constantly on the move. Left foot left landing. The right leg knee squat. Left leg straight down into the left and step. At the same time, the left hand palm forward, Shun in the left medial left wear to the left side, palm and finger toward the left, palm forward. Look at the left palm. The focus shifted to the left, turn left. Right foot forward, toes point, left leg squatting in empty step into the right. The left arm straight forward, left shoot operation, left palm to the left after the hook, fingertips, wrist and head flat. The right arm down and forward runs, the right palm to palm body established before, palm facing left, the point of the elbow and the knee with fingertips, and eye level, visual ahead. Body left, right foot to the right foot. Left knee squat, right leg straight down into the right and step. At the same time, the left hand become boxing boxing heart toward back to the hip. The right hand to left, towards the front of the right palm, along. The visual front. The focus shifted to the right, turn right. The left pedal straight, right before the arch into a right bow stance. At the same time, the right hand turn boxing, boxing heart toward the back waist, left hand fist down move out, force of the left fist, arm and shoulder level, visual ahead. (1) left sincere heart toward back waist. Left foot lift straight forward kick. At the same time, the right hand fist down move out, Lida r.. Looking ahead. (2) constantly on the move. Body right. Left foot left landing legs, squat, double knee abduction into bu. The right hand, palm facing up to the top 10 cm. Left sincere heart towards the left out, force of the left fist, visual left. (1) body turn right at the 90 foot lift straight on the left front side. Change right hand fist, fist heart up to the waist, left hand turn palm palm up, right on the forehead to run, palm down to above his right knee. The arm and shoulder. The visual front. (2) constantly on the move. The right leg on the left leg back left, front foot, right knee and left leg bent offset, 90 left legs squat body to rest step. At the same time, the left hand become sincere heart toward to the waist. His fist down right out, Lida r.. Visual right. Turn right at the 180 (1). Bring his right foot straight on the left knee. At the same time, his fists put relative operation, left palm facing up, left out by his right wrist, fingers pointing left, palm forward, right hand palm down along the left arm under the direction of running, palm facing left to right armpit, eyes look to the left palm. (2) constantly on the move, the right foot to the right landing, left knee squat, right leg straight down into the right and step. At the same time, right hand palm forward, right leg medial right through to the right foot, palm and finger toward the right, palm forward. Visual right palm. After the center of gravity shift, body right 90, left leg forward, toes point, right leg squat into left empty step. The right arm straight forward, right after the operation, the right palm to the right after the hook, fingertips, wrist on the head. His whereabouts, and then move on to run, the left hand to body established before palm, palm facing right, the point of the elbow and the knee with fingertips, and eye level, visual ahead. Left foot landing, body right 90. The right foot to the left side, legs and step. Your hands become sincere heart toward back to the hip, head left, visual left.